I love Dragonflies for a Tiffany Lamp. The coloring is so perfect! It looks just like the picture. I have had a lot of compliments on the shade. What a great find! This is the most beautiful lamp I have purchased yet! It has such style and the colors are so vibrant and provides a warm light to any room. I would recommend to anyone that enjoys the tiffany-style lamps. 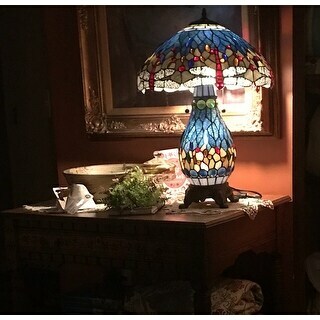 # 1135229 Tiffany -style Blue Dragonfly Table Lamp.I just love this lamp! I had been wanting a stained glass lamp with a lighted base for a long time, and this one is perfect..the size is great, & the colors are beautiful. It was packaged very well, and came in good time. Think I will order another one, as I keep thinking of other places where it would look great! Even my husband loves it ! On-line doesn't do this lamp justice - it is spectacular in person, especially when lit. Packaging was perfect, packed in foam form fitted to lamp prevented any damage. Assembly couldn't be quicker or simpler. Breath-taking when turned on. The base light is a little dim used with the included bulb, but with candles lit in room makes for a romantic setting. The colors are brillant when all lights are turned on; the blues could not be prettier if you like blues like we do. The lamp is large so one needs to take that into consideration when choosing what table to place it on. I will order another one of these types of lamps from OS, not the same one as I am not into "matching" things of this sort. Let it stand out in it's own beauty. I can see this lamp used in several rooms of my home, but right now is in my living room. It really makes a statement and I would recommend it to anyone looking for something different, especially for the price, can't be beat. Being a stained glass artist myself, I am sure that it would cost me almost that much in materials to construct it myself! If they get more in, go ahead and order it,, I do not think you will regret this purchase. I LOVE this Tiffany Style Blue Dragonfly table lamp which I am using on a tall round table (also from Overstock) in a corner of my dining room. I put a 25 watt LED bulb in the base and it mekes the colors there SO much more vivid!! It is BEAUTIFUL when lit and gets many compliments. This Tiffany styled red dragonfly lamp with beautiful blues, delicate yellows and clear wings of soldered art glass is a joy to look at the glowing colors, especially in wintertime. The lighted base is great as a night light or just enough light for late night tv viewing. The height is perfect, while the colorful shadow it casts with the under glow is lovely. It's definitely glass and is exactly as expected. It was very fast and easy to assemble using instructions given. Careful handling of the art glass is necessary at all times. Purchased another once I received the first one. Very happy with this item. Would readily order again. Club O membership rewards made ordering multiples of these lamps more affordable. 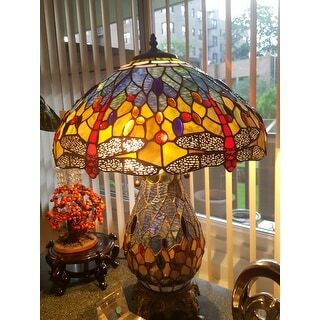 Beautiful stained glass tiffany style table lamp. Great quality, wonderful packing, love that the base lights up too. Great price as well. We're very happy. This lamp is total eye candy. Between the glass pieces and the jewels, it is a marvel. The clear wings on the dragonflies makes them seem like the real thing with their transparent wings. If you can only get one, this should be it. The lighted bottom part would make a great night light. I am an interior designer and Overstock is a wonderful source for beautiful and quality items. Recently, I purchased this blue dragonfly Tiffany style table lamp on behalf of my client who fell in love with the detail of it! The lighted base keeps the room softly lit and when the lamp is turned on, all eyes are on this gorgeous beauty! everyone that come over all they talk about is this lamp. I should lie and say i paid $400 and they would beleive me. 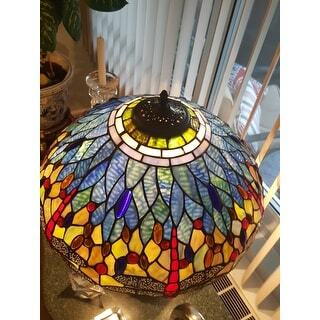 This is a very good example of a tiffany style dragonfly lamp. The blues are absolutely gorgeous when the lamp is turned on. I would recommend this product highly. The lamp arrived as promised, in perfect condition. It was well packed and is stunningly gorgeous, especially when lighted. The base light can be used alone or with the two lights in the upper lamp engaged. If I needed another one, I'd buy the same lamp all over again. This lamp is beautiful. We already had the same lamp in green tones that we loved, so we got the blue one for the family room. I'm the artsy type and don't like boring furnishings or fashions. These over the top lamps are just wonderful for people like me! I love color and unique things. These lamps do not disappoint but are definitely not for the faint of heart. If you like beige, cream and earthtone boring decor, these lamps are SO not for you! These go great with my eclectic taste! My husband isn't too thrilled with them but he's used to my wild taste and will just have to get over it! LOVE THEM!!!!!! I got both colors!!!!!! Gorgeous, beautiful colors and very nice size. Better then expected I have it by the window and look amazing day or knight. Worth every penny highly recommend. This one is definitely a gem. This is a beautiful lamp which is the exact dimensions and looks as described. The description said the origin is Switzerland. However, a "Made in China" sticker was found on the lamps. We have 2 of these lamps on our dresser. The night light is great for ambient lighting and the two bulbs add that much more light for our needs. They are beautiful and we love them very much. I love my lamp it is so beautiful ! It was easy to put together I plan to buy another one when I Pay off my account. This lamp is perfect!! The blues and reds really shine when the light in on. I wanted something to match the blues in one room to go in the window that would look pretty from the outside at night! PERFECT!! This lamp is absolutely beautiful! The colors are vibrant, and the wings of the dragonflies sparkle like diamonds. I would definitely recommend this lamp. 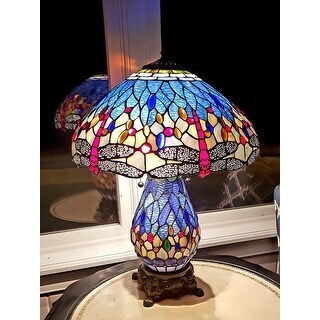 These are absolutely beautiful...Would recommend to anyone looking for Tiffany style lamps. Replaced my old Tiffany lamps with these. Bought 2 of them. My old ones were much higher and had for 16years..wanted lighted base this time. They are much shorter but like them much better. You will not be disappointed in these at all..Just love them....and such a good price.. The lamp is just beautiful. I wasn’t sure what to expect. The craftsmanship is done very well!! Simply beautiful! I couldn’t have asked for anything nicer. Thank you Overstock!!!! Just beautiful!!! Love the night light part of the lamp. "Is there any way I can purchase just the lamp shade. Mine it broken. the lamp itself is still perfect. Please help me find just the shade for this lamp. thank you, TrudyAnn Gripp"
Trudy, I am sorry your shade is broken. I would be devastated. And then I would contact the manufacturer, which you should be able to find listed on the bottom of the lamp. Or, you may have to send a note to Overstock Customer Service, asking them for the manufacturer name. Good luck! "The two pictures show slightly different color patters. The one showing the lamp on the table shows a white stripe around the bottom of the base and the top of the shade, while the picture against the white background shows a blue stripe. Can you tell me which picture is accurate?" What you are seeing are photos of the lamp lit (on table) and not lit. The bottom glass is blue but it turns nearly white with the lamp base bulb turned on. It's beautiful, regardless! "More to the question below. Can I replace the lamp if I can not just purchase shade.? And how do I do a replace? #1135229 Dragonfly Table Lamp w/ lighted base. Blue"
"Hello. I have the Tiffany-style blue Dragonfly Table lamp w/ Lighted Base. Sadly the shade has broken from the beautiful lamp. Is it possible that I can buy just the shade? I am heart broken losing the shade. " Unfortunately no, we don't sell just the shade. We apologize for any inconvenience we might have caused. Need blue colors, like the base lighted also. I was looking for a lamp with a night light. When I saw this one, I fell in love. The colors go perfect with my bedroom. Thank you! "Is the bottom 25 watt bulb already installed or is this something you have to figure out how to install? thanks"
Hello gamoviestar, you will need to install that yourself. It will include instructions on how to install the bulb. Thanks for shopping with us! A.S. Mine was already installed. LOVE this lamp!!!!! "what is the difference between item#1135229 and item#964475? They look the same except for the price." Thank you for your question, niatcu8100. 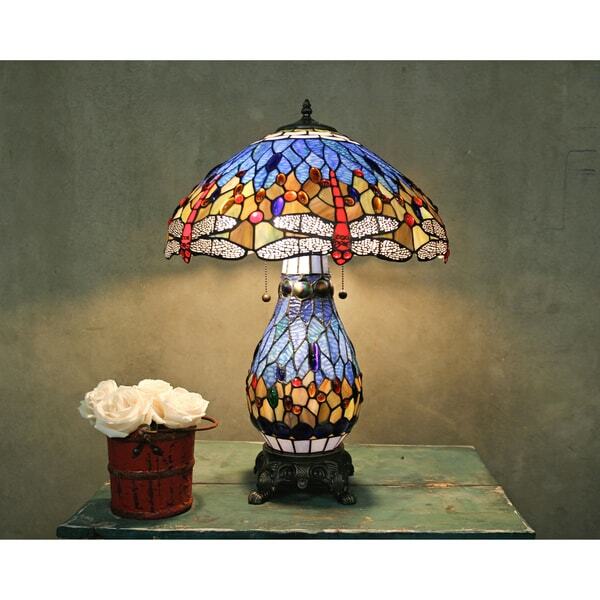 The Tiffany-style Dragonfly Lamp with Lighted Base, item 964475 and the Tiffany-style Blue Dragonfly Table Lamp with Lighted Base, item 1135229, are different in that they do possess different color, one is more green and the other is more of navy blue. Also, they are different because they are come from two different manufactures. Have a great day.